This is for the grans challenge this month. I got my inspiration from a layout by Bethany.roisland called You are so loved. The photos are my DH sledding with 2 of the grandsons. This is a duper layout. Love the snowflakes and brrrr is right. Great pics- beautiful bg pp and love the snowflakes! Love the bg pp!! Did you stamp those flakes or were they on the pp already... Love it, so playful and cold looking!! So pretty! Love the paper and snowflakes! Very pretty!! I can feel the frosty air from here!! Such beautiful papers and snowflakes. The boys will love looking at this, over and over. 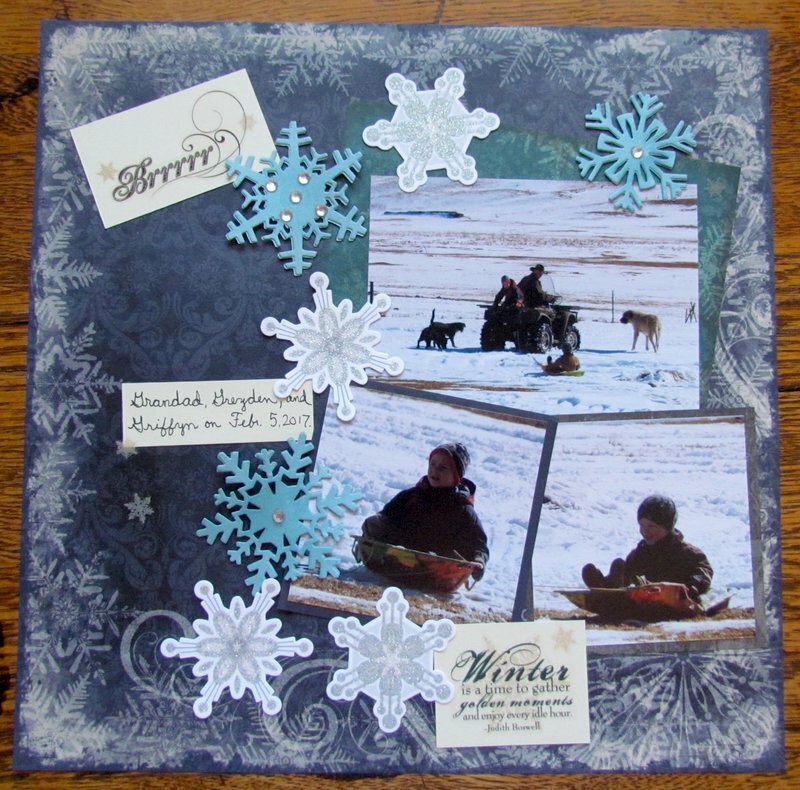 I like the bg paper you have used for these pictures, I have been sitting here just looking at the wide open spaces filled with snow and all the fun everyone has in between the work!! Lovely snowflakes with added bling! A great page for the challenge. I love the winter paper and snowflakes. Beautiful memories are being created for your grandchildren!